President Trump fires HHS Secretary Tom Price – not for his questionably legal stock trades, for serving as a political lapdog in trying but failing to torpedo the laws he swore to uphold, or even for squandering hundreds of taxpayer dollars on unnecessary charter and military flights — but rather for embarrassing the President in the press coverage about the flights, admitting his wrongdoing, and offering only partial taxpayer reimbursement. Appointed as interim HHS secretary is Deputy Assistant Secretary for Health Don Wright, MD, MPH, an HHS long-timer who replaced Karen DeSalvo, MD, MPH in the January 2017 administration change. The permanent replacement will almost assuredly, like Price, have credentials that are more political than clinical. Politico’s list of rumored candidates includes some current and former members of Congress, Dr. Oz, CMS Administrator Seema Verma, Florida Governor Rick Scott, the VA’s David Shulkin, FDA Commissioner Scott Gottlieb, former Louisiana governor Bobby Jindal, HUD Secretary Ben Carson, and Don Wright himself. A bunch of us have had our information exposed in Equifax’s breach, although nearly as many of poll respondents have lost interest reading about the breach du jour. Some respondents expressed optimism that “the big one” may force companies to get their security act together, while several others said they’ve placed an indefinite freeze on their credit accounts with the belief that the hassle of unfreezing them as needed is still better than cleaning up the post-breach mess. New poll to your right or here: should a vendor’s newly announced customer be required to attest that they hold no financial interest in the company? PeriGen acquires Hill-Rom’s WatchChild fetal monitoring system. The local paper spotlights the refusal of the Texas Department of State Health Services to release pregnancy and maternal death statistics to reporters interested in why death rates doubled in one year. PE firm Warburg Pincus announces plans to acquire Intelligent Medical Objects. Former President Bill Clinton, stumping for his wife’s presidential campaign, calls the Affordable Care Act “the craziest thing in the world” because of risk pool limitations. The UK’s Department of Health admits that its contract with CSC requires it to turn custom-developed NHS software back to the company after NPfIT was shut down. McKesson announces that it will acquire MED3OOO. Patrick Soon-Shiong’s NantHealth announces that the company will work on personalized medicine with Blue Shield of California and St. John’s Health Center. A KLAS report on how well clinical systems work for nurses gives all vendors a grade of ‘D’ or below. Microsoft announces its HealthVault PHR. MD Anderson redesigns its ClinicStation EMR and CIO Lynn Vogel joins Partners (John Glaser) Vanderbilt (Bill Stead), and Marshfield Clinic (Justin Starren) in an AMIA conference session on homegrown development. CMS awards AHIMA a $10 million contract to evaluate the possible change from ICD-9 to ICD-10. Epic opens the first group of App Orchard products to public access. A VA OIG report finds that the DoD is not sharing attempted suicide information with the VA despite a 2014 federal mandate. The American College of Radiology and SIIM hold a session and a conference, respectively, on use of artificial intelligence in medical imaging. Senate Republicans fail to bring the Graham-Cassidy bill to a vote. FDA chooses the digital health software vendors that will participate in its software precertification program. 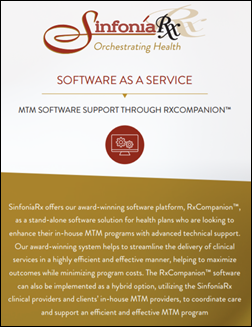 Medication risk management technology vendor Tabula Rasa HealthCare acquires University of Arizona medication therapy management spinoff SinfoniaRx for $35 million in cash. A Wisconsin court reduces the $940 million awarded to Epic in its intellectual property lawsuit against Tata Consultancy Services to $420 million. The original judgment violated Wisconsin law, which limits punitive damages to twice the compensatory damages, causing Epic to suggest a lower figure of $720 million. Epic says Tata employees working as Kaiser Permanente consultants stole thousands of company documents to help Tata create a competing system, but Tata says its lawyers believe the award can be set aside completely on appeal since Tata did not benefit from the information. In Canada, Alberta Health Services signs a $368 million contract to implement Epic. It will replace 1,300 systems that it claims will cover most of the project’s overall $1.2 billion cost, although the province’s auditor is skeptical. 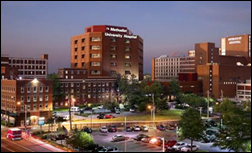 Methodist Le Bonheur Healthcare (TN) will implement the PatientTouch communication and clinical workflow platform from PatientSafe Solutions. Mammoth Hospital (CA) will go live on Cerner Millennium in October 2017. Osceola Medical Center (WI) will switch from Evident to Athenahealth in January 2018. Jersey Shore Hospital (NJ) will replace Meditech with Epic in April 2018. Memorial Hospital (IL) will switch from Evident to Epic in November 2017. St. Francis Memorial (NE) Hospital will replace McKesson with Cerner in 2018. These provider-reported updates are supplied by Definitive Healthcare, which offers a free trial of its powerful intelligence on hospitals, physicians, and healthcare. Don Woodlock (GE Healthcare) joins InterSystems as VP of HealthShare. OurHealth hires Brian Norris, MBA, RN (Aledade) as VP of analytics. Black Book names its 50 health IT disrupters and challengers. UMass Memorial Health Care was scheduled to go live on its $700 million Epic project this past weekend, replacing Siemes/Cerner Soarian. 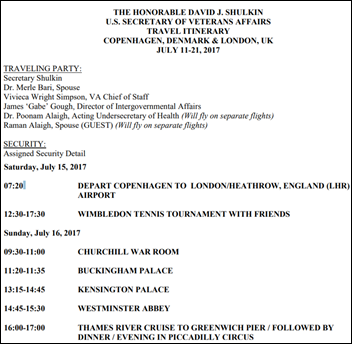 Meanwhile, the VA’s Shulkin has his own Tom Price-like problems to deal with as the Washington Post discovers that a taxpayer-paid trip to Europe included, in addition to discussions with officials in Denmark and England initiated by the VA, attendance at the Wimbledon championship and a cruise on the Thames that also included his wife, four other travelers, and six-person security detail. He took the trip, about half of which didn’t involve government business, less than two weeks after demanding that VA executives approve only essential travel. The US Supreme Court will hear arguments Monday in a federal labor case that involves Epic and two other companies, a key issue being Epic’s requirement that employees sign away their rights to sue the company over labor issues and instead submit to arbitration. Performer Cher sues Patrick Soon-Shiong for stock sale fraud, claiming that a drug company convinced her to sell back her shares cheaply and then sold the company for a higher per-share price to Soon-Shiong’s NantCell. The suit says Soon-Shiong paid $15 million for the company that is now worth $1 billion. Temple University Health System (PA) attributes its $23 million budget shortfall primarily on the implementation of Epic, mostly due to high-than-expected staffing costs and its impact on operations improvement goals. 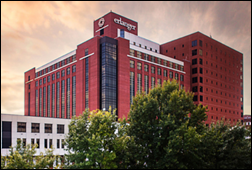 The president of Erlanger Health System (TN) says its 67 percent drop in net income from operations in the fiscal year is mostly due to its Epic implementation costs, as the health system paid Epic $33 million this year. However, revenue exceeded budget, also due to Epic. 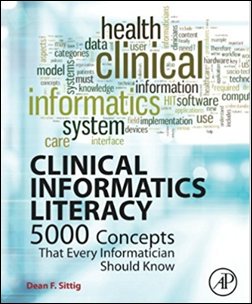 Dean Sittig, PhD, biomedical informatics and bioengineering professor at The University of Texas Health Science Center at Houston, just published a new book on informatics terms. Not sure if you need it? 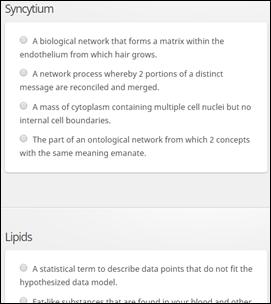 Take this 10-question multiple choice informatics terminology quiz that Dean created at my suggestion, check your score at the end, and then let Dean help you do better if needed. Here’s Vince’s latest 30-year look-back on the health IT industry, which addresses the DoD’s 1987 EHR bid and the birth of HL7. Weird News Andy calls this DWI – driving while immature. 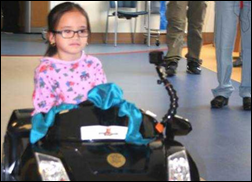 Rady Children’s Hospital rolls out (no pun intended) little cars that peds patients can “drive” (they’re actually controlled remotely) to the OR to help them relax before their procedure. The kids – like their surgeons with their larger equivalents – can choose from among a BMW, Mercedes, or Lamborghini. QuadraMed, a Harris Healthcare company, and T-System will exhibit at AHIMA October 7-11 in Los Angeles. Salesforce announces $50 million donation and 1 million volunteer hours to further computer science education. The SSI Group will exhibit at the NJ HFMA Annual Institute October 4 in Atlantic City. Surescripts will exhibit at the EClinicalWorks 2017 National Conference October 6-9 in Grapevine, TX. Versus Technology will exhibit at MD Expo October 5-7 in Orlando. Boston Magazine includes ZappRx CEO Zoe Barry on its list of Bright Young Things. ZeOmega will exhibit at Change Healthcare’s Inspire Change Healthcare Solutions Conference October 2-5 in Philadelphia. Lightbeam Health Solutions and Experian Health will exhibit at the NAACOS Fall Conference October 4-6 in Washington, DC. Logicworks earns PCI DSS Level 1 Certification for the sixth straight year. Navicure will exhibit at the EClinicalWorks National Conference October 6-9 in Grapevine, TX. Netsmart will exhibit at the CBHC Annual Behavioral Health Conference October 4 in Breckenridge, CO.
Clinical Computer Systems, developer of the Obix Perinatal Data system, will exhibit at the University of Iowa Health Care Children’s & Women’s Services Fall Nursing Conference October 2-3 in Coralville. PatientSafe Solutions will exhibit at the 2017 IntegraTe 2017 South Florida HIMSS event October 4 in Davie, FL. The Metro Atlanta Chamber selects Patientco as one of seven companies to join its first cohort of Backed by ATL businesses. PokitDok will present at Health 2.0 October 3 in Santa Clara, CA.